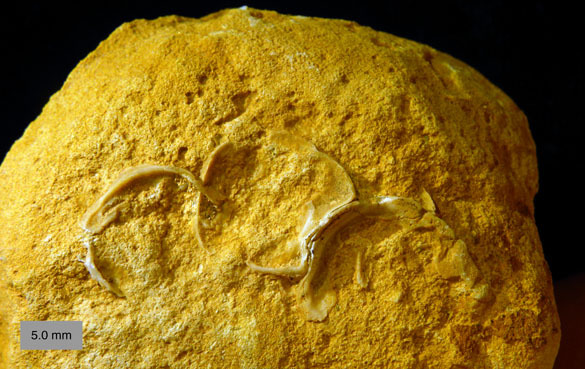 Reworked concretions have been significant substrates for boring and encrusting organisms through the Phanerozoic. They provide large, relatively stable calcareous surfaces in systems where sedimentation is minimal. 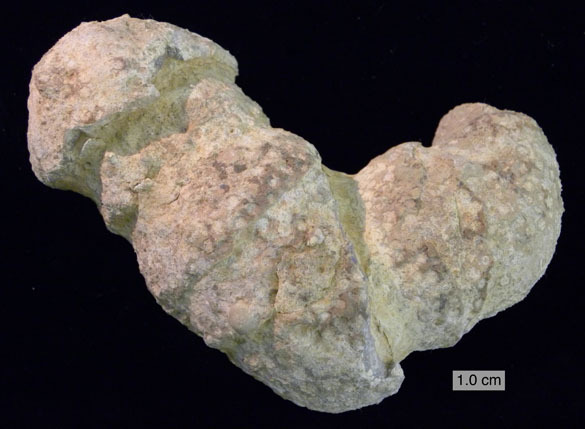 Diverse sclerobiont communities have inhabited reworked concretions since the Ordovician, so they have been important contributors to our understanding of the evolution of these ecological systems. 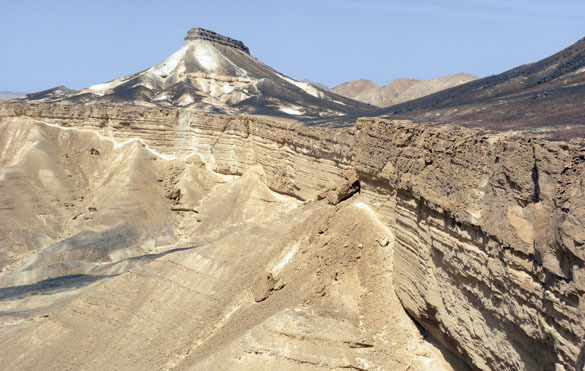 Here we describe reworked concretions from southern Israel where they are critical for interpreting the stratigraphy and paleoenvironment of an Upper Cretaceous sedimentary sequence. These cobble-sized concretions (averaging roughly 1000 cubic centimeters) are found at the base of the Menuha Formation (Santonian to lower Campanian, Mount Scopus Group) unconformably above the top of the Zihor Formation (Turonian-Coniacian, Judea Group) exposed in the Ramon region of the Negev Highlands. 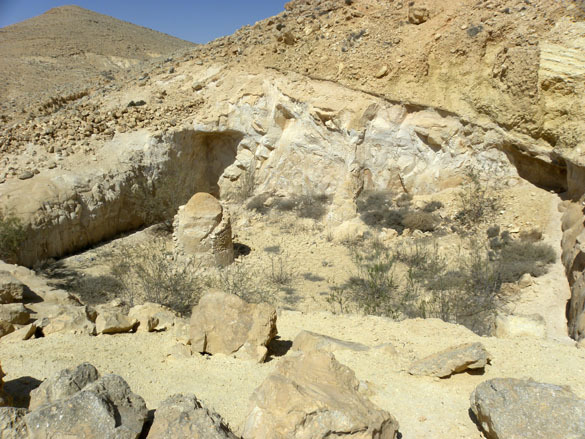 The concretions are almost entirely composed of micritic limestone, and many are exhumed cemented burrow-fills apparently from 10-20 meters of upper Zihor Formation strata removed by erosion. There are also a few cobbles of dolomitic limestone and rare vertebrate bone. The cobbles are moderately to heavily bored by bivalves (producing Gastrochaenolites) and worms (forming Trypanites), and a few have cemented oysters. They are densely arrayed in a single layer, often touching each other or only a few centimeters apart. The sclerobionts associated with the cobbles, along with their hydrodynamic arrangement, strongly suggest that these cobbles accumulated in very shallow water above normal wave base. Most of them (77%) are encrusted on their top surfaces only, indicating that they were bored in place and not later delivered to a deeper environment by submarine currents. 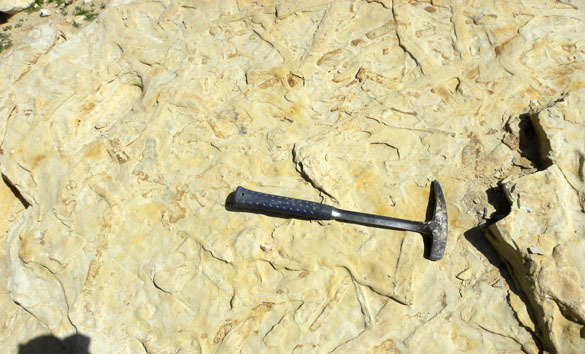 The rest of the Menuha Formation above is a chalk with relatively few macrofossils (primarily shark teeth and oysters) and a few trace fossils (Planolites and Thalassinoides are the most common). These reworked cobbles show that the initial deposits of the Menuha Formation accumulated in very shallow water. This has important implications for the development of the Syrian Arc structures in this region, especially the Ramon Monocline. Two cobbles in their natural setting: embedded in the chalks at the base of the Menuha Formation. The beautiful setting south of Makhtesh Ramon. The cliff is an exposure of the resistant Zihor Formation; above it are the white slopes of the far less resistant chalky Menuha Formation. The cobbles are found at the base of the Menuha. A figure from the manuscript itself showing a cross-section of a cobble. 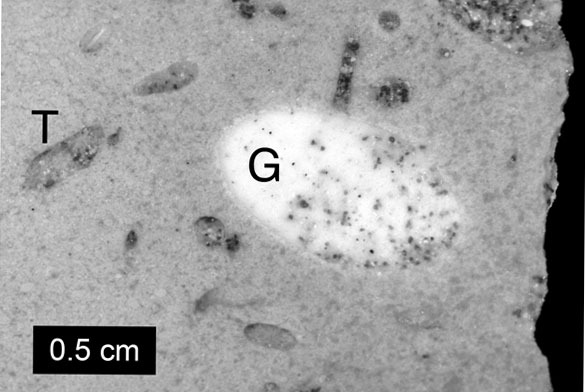 The “T” indicates a Trypanites boring; the “G” shows a Gastrochaenolites boring. Thank you again to Wooster alumni Micah Risacher and Andrew Retzler and current student Will Cary for helping us collect these specimens! Wilson, M.A., Zaton, M. and Avni, Y. 2012. 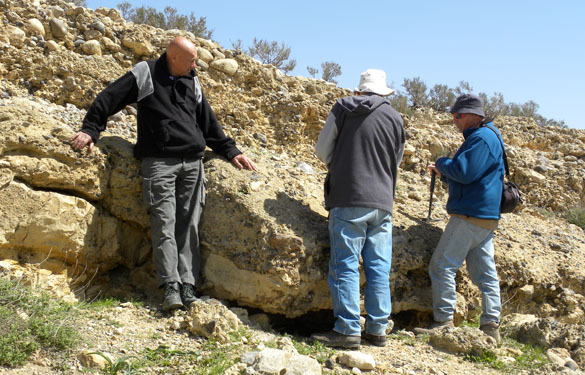 Origin, paleoecology and stratigraphic significance of bored and encrusted concretions from the Upper Cretaceous (Santonian) of southern Israel. Palaeobiodiversity and Palaeoenvironments (in press). SLIPPERY ROCK, PA – I’ve just returned from the March meeting of the Pittsburgh Geological Society. If you’re in the region and you’re not a member, you really should think about joining. On the third Wednesday of each month, a robust group of faculty, students, and professionals gather for a social hour followed by a tasty meal and a geo-talk. I was honored to have the opportunity to speak about my passion for basalt geochemistry and was fully impressed by the friendly, engaged audience. The questions from the students, in particular, were clever and insightful. (Attention potential employers: the PGS is your regional source for the next crop of professional geologists). The PGS also runs field trips, and my host, Dr. Patrick Burkhart, took me on a tour of glacial features near his home institution of Slippery Rock University. A google map image of the glacial features near Slippery Rock, PA. The numbers correspond to the images below. (Imagery from DigitalGlobe, GeoEye, USGS, USDA Farm Service Agency). We began our trip at the Jacksville Esker (also known locally as the West Liberty Hogback or Miller Esker), which may be the best-preserved esker in Pennsylvania (Fleeger et al., 2003). The >6 mile-long esker is an elongate, sinuous ridge of sand and gravel that was deposited about 23,000 years ago by meltwater in a subglacial tunnel (Fleeger and Lewis-Miller, 2009). 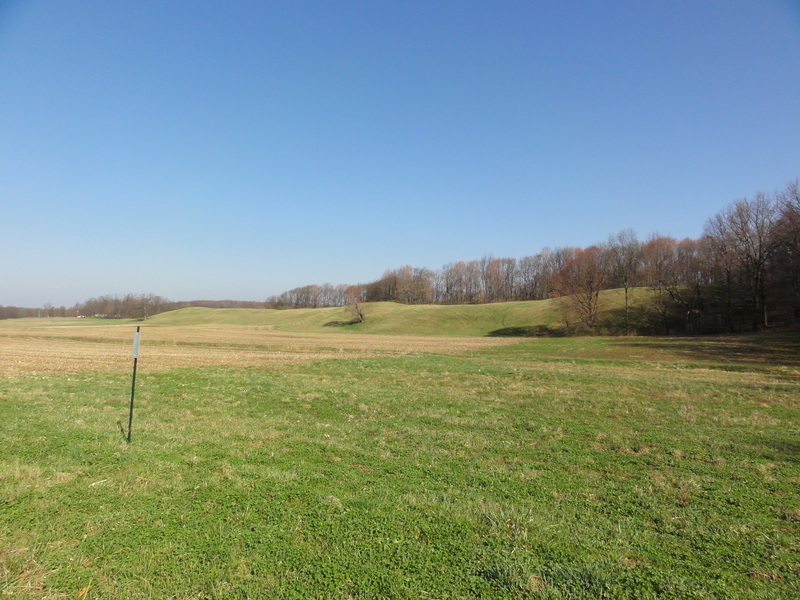 Photo #1: View of the elongated ridge formed by the Jacksville Esker. 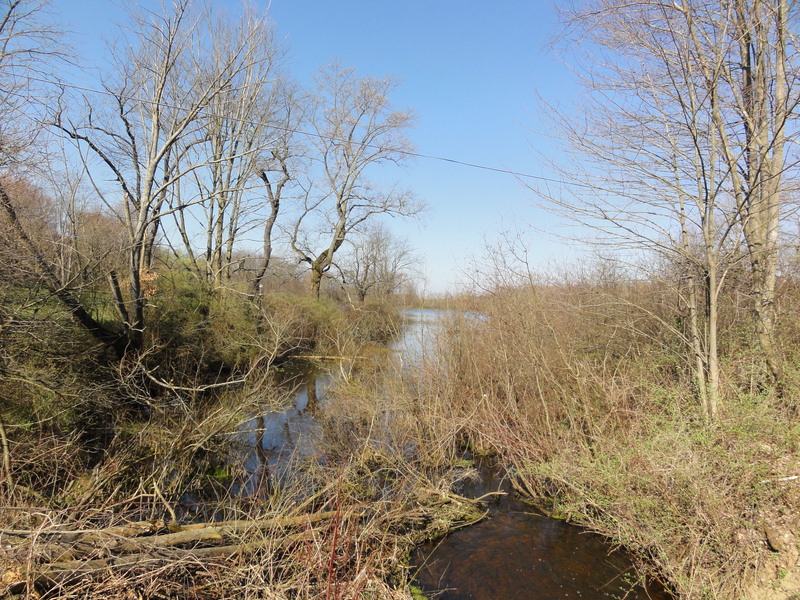 Adjacent to Jacksville Esker is Tamarack Lake, an ecologically important wetland. 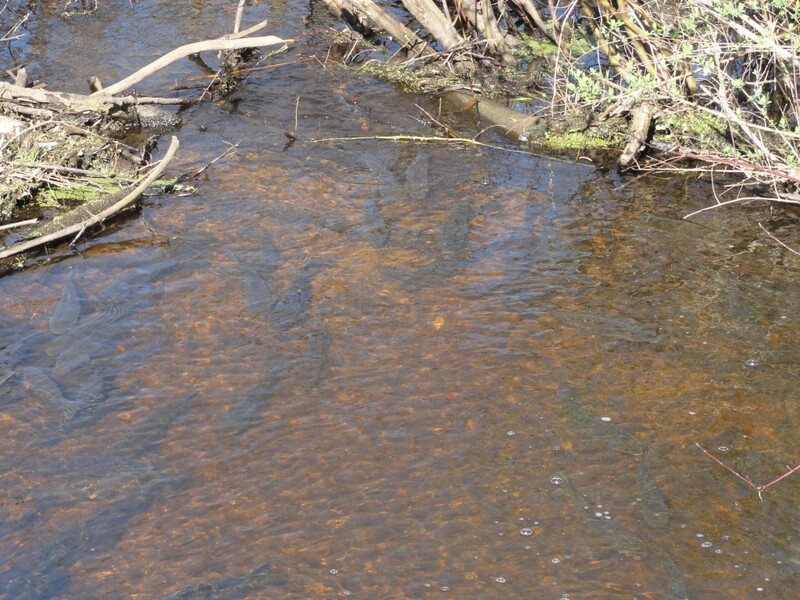 We viewed Tamarack Lake from Swope Road, which cuts through the esker, and noticed a school of trout in the water near the road. I imagined that they were enjoying the warm spring day. Photo #2: View of Tamarack Lake from Swope Road. Photo #3: Trout enjoying the warm water at Tamarack Lake. Jacksville Esker ends in the Kame Delta, which formed in a proglacial lake. 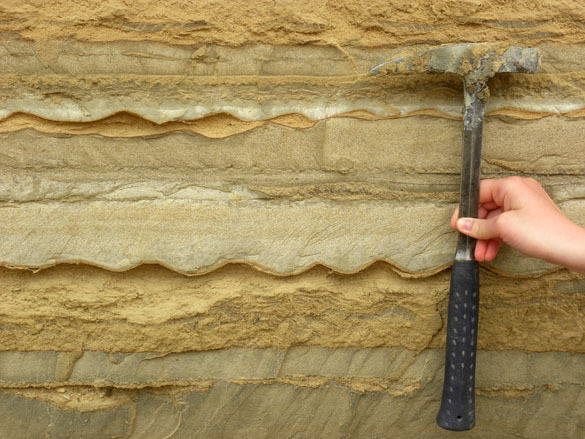 Sediment in the delta is generally well-sorted, ranging from fine sand to cobbles, and is currently being mined by the Glacial Sand and Gravel Company (Fleeger and Lewis-Miller, 2009). We didn’t get to tour the quarry, but according to the field guide, mining has exposed crossbeds, ripples, and multiple foreset beds that suggest that the delta was built by a series of depositional events (Fleeger and Lewis-Miller, 2009). Photo #4: View of the relatively flat-topped Kame Delta. The gravel mining operation is located near the center of the photo. We saw a few other things on the trip, but I think I’ll save those for another post. 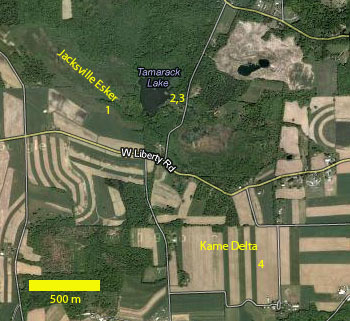 Fleeger, G. M., and Lewis-Miller, Jocelyn, 2009, Stop 7: Jacksville esker, delta, lake plain, and drainage diversion complex, in Harper, J. A., ed., History and geology of the oil regions of northwestern Pennsylvania. Guidebook, 74th Annual Field Conference of Pennsylvania Geologist, Titusville, PA. p. 146-159. Fleeger, G. M., Bushnell, K. O., and Watson, D. W., 2003, Moraine and Mc- Connells Mill State Parks, Butler and Lawrence Counties—Glacial lakes and drainage changes: Pennsylvania Geological Survey, 4th ser., Park Guide 4, 12 p.
TEL AVIV, ISRAEL–Always a happy scene. After a long dark drive through the desert early this morning, and then the adventure of Tel Aviv traffic, Melissa and I are safely in Ben Gurion airport. We had a lot of questions from security (at three levels), but were ushered through in record time. All is well, and we are anxious to get back to the USA. 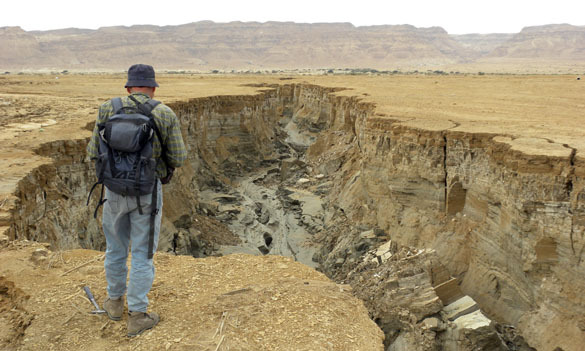 A very serious problem related to the drop in the water level of the Dead Sea is the development of large sinkholes in the coastal plain. These holes develop with little warning (if any) and have caused significant damage to structures, roads and agricultural lands. 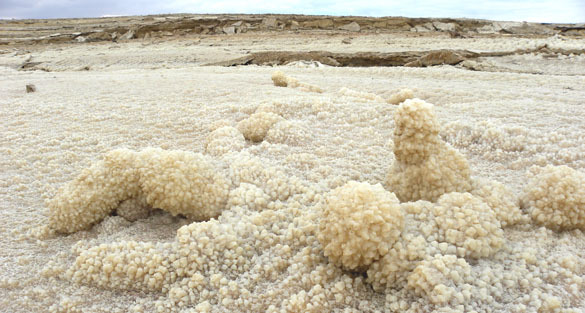 They form when the salty groundwater is replaced by fresh water as the Dead Sea recedes. This fresh water begins to dissolve subsurface salt deposits, producing caverns that eventually collapse. There are over 3000 of these sinkholes now on the western side of the Dead Sea. It is increasingly difficult to plan roads and other developments when you wonder if the ground beneath is going to suddenly give out. This is a chain of sinkholes that continues to grow. Note the circular tension cracks in the foreground. One of the issues now is whether these holes capture significant surface flows during floods, channeling still more water underground to dissolve more salt. There has been a nearly exponential increase in sinkholes, so it is likely some mechanism like this is also at work. 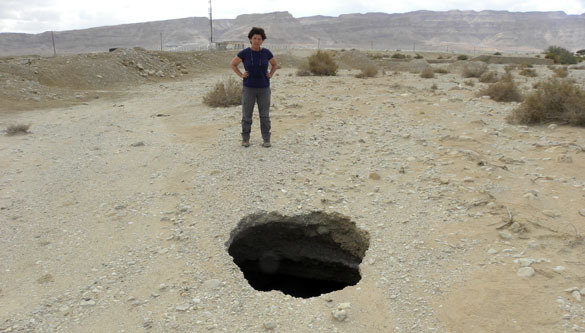 Noa Avni stands near an incipient sinkhole. They sometimes appear as these small, round holes. Looking inside, we could see that there is a significant room-sized cavern underneath. Soon the roof will collapse and a new mature sinkhole will appear. 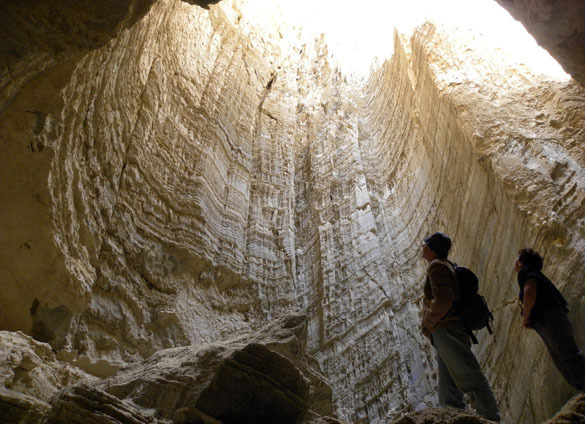 Israeli geologists are under considerable pressure to predict the appearance of sinkholes and the large gullies so that engineers can either attempt to “fix” them or find other places to build infrastructure. The geological issues are very complex, though, and a significant amount of randomness exists in the systems. I’m glad I have the kind of geologist’s job that doesn’t involve such practical testing and high expectations. MITZPE RAMON, ISRAEL–Today we saw the Dead Sea in an amazing way. 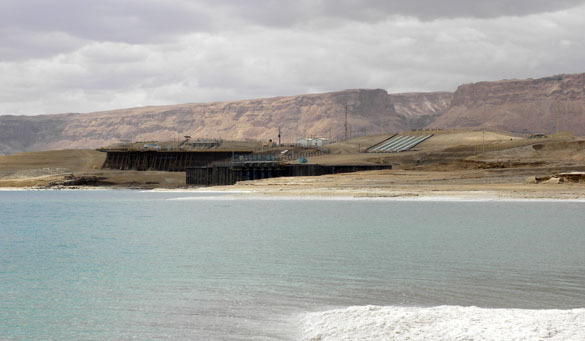 Yoav is working on a project involving the siting of a new pumping station along the western shore of the Dead Sea. We had a preview of a trip he is taking on Monday with a group of government officials to discuss the environmental and geoengineering factors that should be considered during this construction. 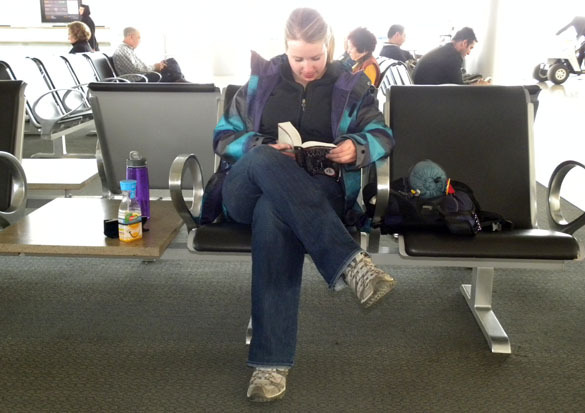 We were able to go to places rarely visited, and to have an account and analysis by a well-respected expert. 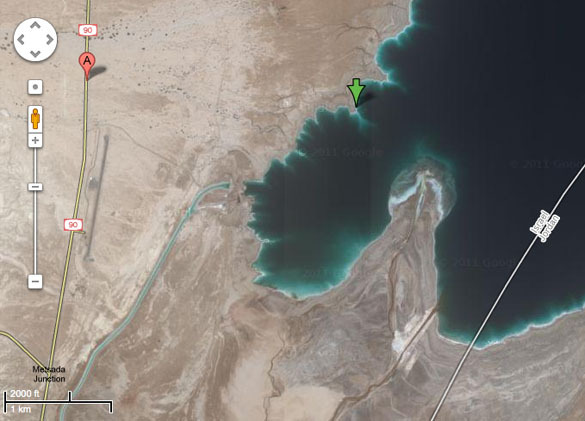 This is a Google Maps view of where we explored the shoreline of the Dead Sea. The green arrow marks our lunch spot (N31.33594°, E35.41427°). Note the thin bluish canal in the lower left running through the scale. The top end of it is where the pumping station sits today. It is pumping water into the southern evaporation ponds to be used in the Dead Sea Works mineral extraction process. We walked down an active gully of an alluvial fan to meet the edge of the water. Its deep blue color was striking. 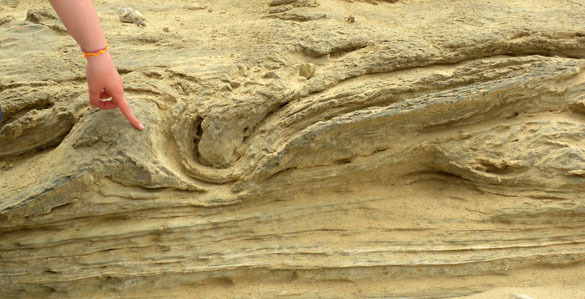 The raised brown area in the background consists of dissected Dead Sea bottom sediments. 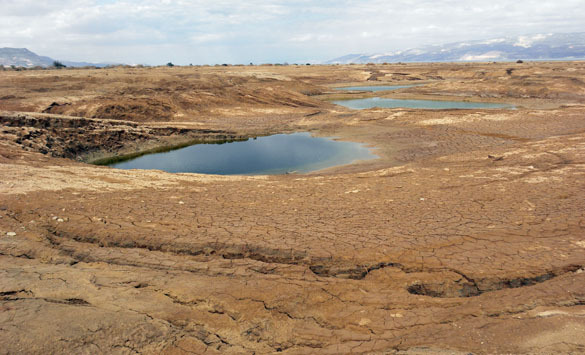 Water levels have been dropping about one meter a year for decades now, leaving vast areas of Dead Sea mud exposed and eroded. 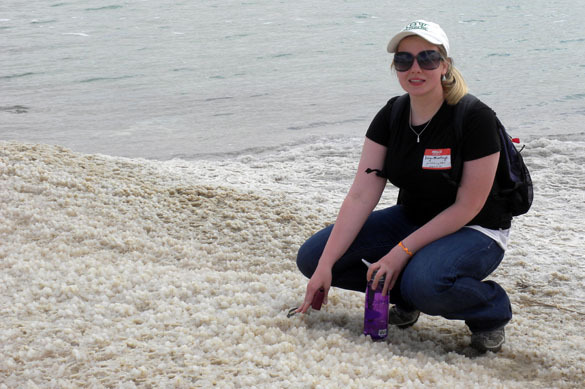 Melissa examining the halite crystals at the edge along the shoreline. It is very thick from the receding water levels and storm waters splashed up on shore, precipitating salt crusts. This is the pumping station today. It must be replaced soon because the water levels are dropping rapidly, which will leave its intake systems exposed. This station pumps water to the southern evaporation ponds about three months during the summer. This is when the brines are at maximum concentration. That is Masada, by the way, in the background on the far right. All of us who teach sedimentary geology talk about teepee structures formed when crystallization pressures expand an evaporative mineral sheet until it breaks and bends. Can there be a better example than this? Here is another teepee structure in side view with a hammer for scale. The broken apex is visible at the top of the arch formed by crystals growing with nowhere to expand but up. I’ve seen these in outcrops of ancient evaporative sequences, but never in a recent situation. Our lunch stop. We are seated on the salt looking across the Dead Sea at the beautiful mountains of Jordan. 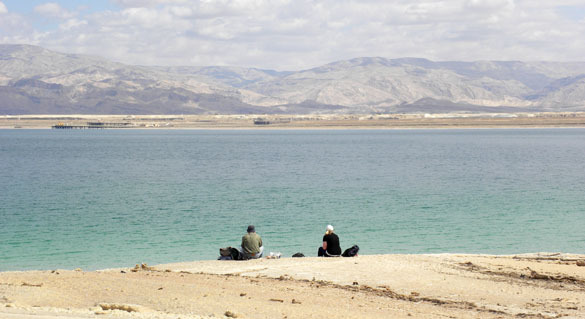 A Jordanian pumping station for their own mineral operation is just visible on the opposite shoreline. This amazed me. There are small pocket beaches along the shoreline made of rounded grains of salt eroded by the waves of brine. 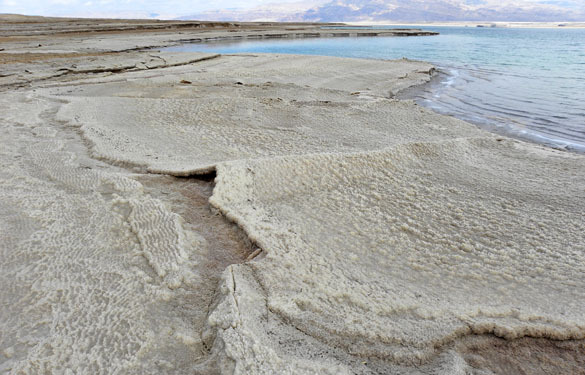 The Dead Sea is forming its own beach sand and granules — all of pure halite. 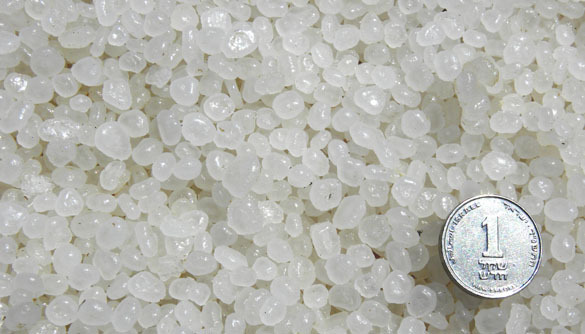 The salt granules are smooth and well sorted by the beach processes. 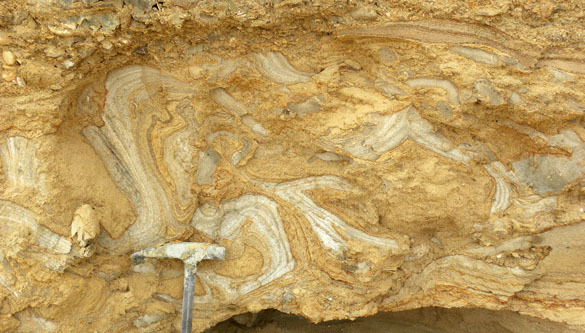 I’d love to bring some of these unique sediment home to Wooster, but the Ohio humidity would destroy it very quickly! We had a great visit to the Dead Sea today, the lowest spot on land (425 meters below sea level). Yoav gave us an excellent tour of this Land of Salt, and the partly cloudy weather meant we could get good photographs without the usual intense glare of the salt crystals in the sun. We were also as warm and dry as we’ve yet been on this expedition! 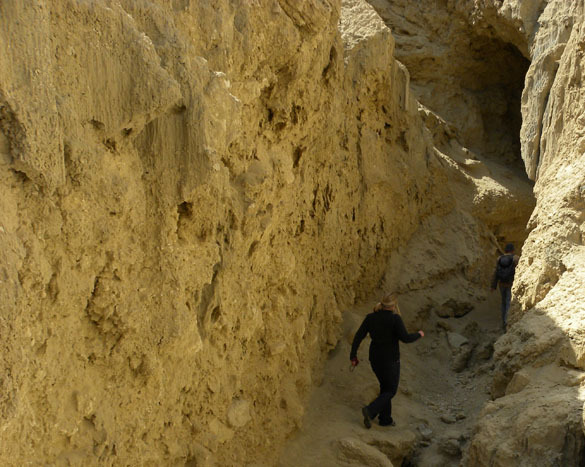 MITZPE RAMON, ISRAEL–Yes, that Sodom. This morning Melissa, Yoav, Noa and I visited a cave formed in Mount Sodom in the Dead Sea Rift Valley. Mount Sodom is a remarkable mountain of halite (sodium chloride — table salt) with very complex internal bedding. It was formed (and is still forming) as subsurface salt was forced above ground by massive overpressure of more dense sands and gravels. It is thus an excellent example of a diapir and a salt dome. 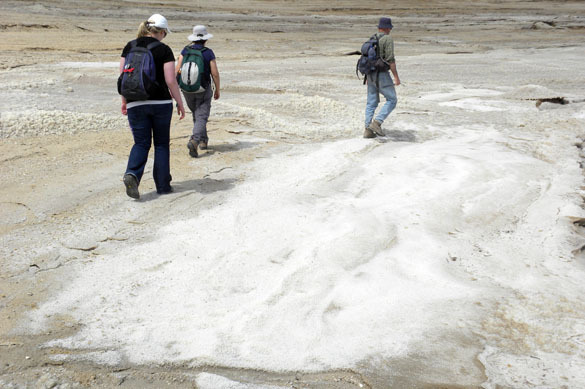 The salt extends steeply upwards with its bedding mostly vertical on the outer flanks of the mountain. 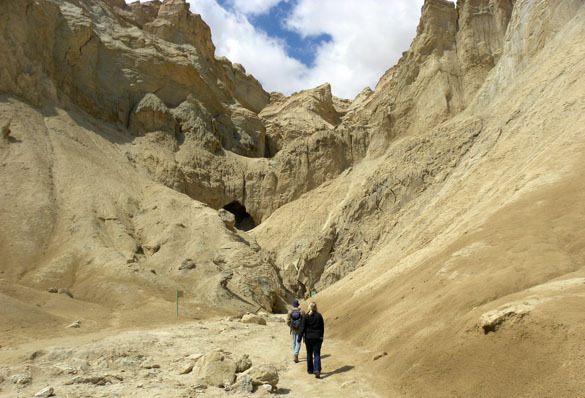 Mount Sodom has thousands of caves formed as rainwater drains through the mountains. It often forms giant vertical solution cavities and then horizontal rooms and tunnels at their bases. These caves are, like most caves, cool on the inside. The solution cavities act like reverse chimneys bringing in breezes that flow out the channels below. Very pleasant places. Melissa on her way into the salt cave. She is walking alongside a vertical wall of pure halite. 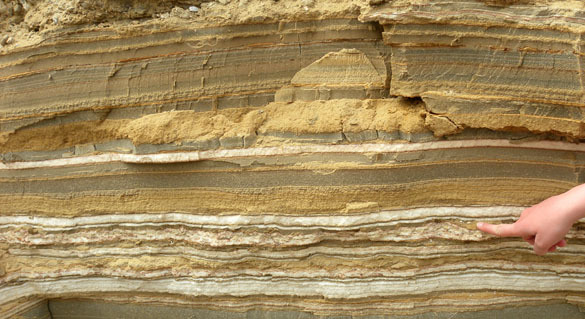 This anticline in the salt is one of the simpler structural features. 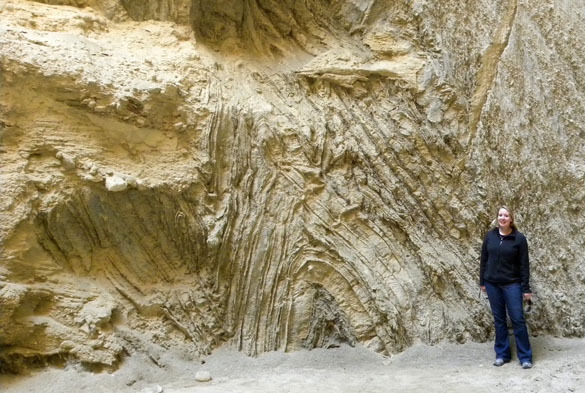 There are also overturned folds, numerous faults, and serious brecciated layers. All of these features are related to the easily-deformed salt squeezing its way to the surface. It is impossible to do justice to these majestic solution cavities with a photograph. The white salt reflects the sunlight all too well, and the lower reaches are relatively dark. Plus this cavity is probably 200 or more meters high. I think Yoav and Noa have suitably awestruck poses here! Without them with us we would not have found this cave or had the courage to enter.